One minute Kip Russell was walking about in his backyard, testing out an old space suit and dreaming about going to the Moon — and the next he was out cold, the captive of an insidious space pirate. The whole thing seemed like a bad dream until Kip discovered there were other prisoners on board, and they were all on their way to the Moon — and a fate worse than death! When Kip Russell wins a runner’s up prize in a soap jingle contest, an intergalactic journey to decide the fate of humanity results. Kip goes from soda jerk to spacesuit winner to alien abductee. Along the way Kip is joined by a pint-sized genius named PeeWee and an empathetic alien known as “the Mother Thing” who together must overcome the alien invaders who want to colonize the Earth. A far-fetched Hard Science Fiction story chock full of pathos and fun! 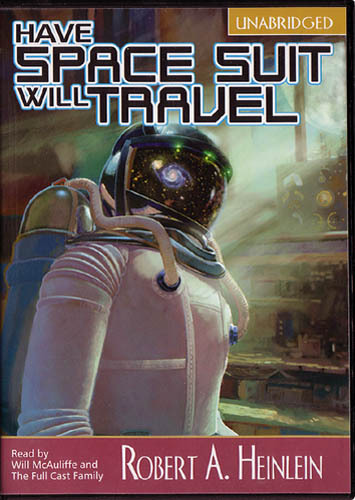 First published in 1958, Have Spacesuit, Will Travel was nominated for a Hugo Award and has steadily remained in print for over 45 years. Though originally marketed as a book for teenage boys, it has found legions of admirers in many other age groups since then. I personally know of a high school English teacher who still uses it to get his students interested in reading! And like most science fiction fans, Robert Heinlein’s juvenile novels hold a special place in my own pantheon of SF novels. They speak to the excitable youth in us like few other books do. When I heard about this particular adaptation I was skeptical. It uses multiple actors, music, and sound effects – this all sounded more like a radio dramatization to me than a straight reading. I’ve been disappointed by many audio dramatizations, I’ve found they often try to “improve” the text and end up cutting it to shreds. I figure you don’t mess with perfection, its just asking for trouble. Well the folks at FULL CAST AUDIO have messed with perfection and come away like heroes! This is a faithful adaptation. The only differences between a straight unabridged reading and this production are a few attributives, the “he said” and “she saids” that are redundant with either a versatile single performer or a full cast of actors. The acting is uniformly excellent, the original music and special voice effects enhance their performance. In short, this production truly shines. But that’s not all. The attention to detail found in the audio production extends to the fit and finish of the packaging. The original cover art is really great, rivaling the superb Del Rey paperback cover art. The CD case too is remarkable… it’s a new design and I’d never seen anything like it before. It resembles a thick DVD style case, with the CDs stacked and held in place by two durable plastic clamps – a space saving and efficient design that also pleases the eye. This audiobook is pure unpasteurized goodness and I truly hope FULL CAST AUDIO does some more Heinlein juvenile novels just like it. 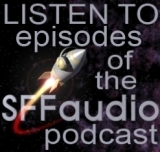 Have FULL CAST AUDIO, will listen!